Of course it’s not really translation, except in the loosest sense — translation into a different medium, I suppose. Sort of like making a novel based on Macbeth (I read one less than wonderful example not long ago), or a film version of The Great Gatsby. Of course it’s obviously part of the challenge, but LEGO isn’t the most flexible of media, is it? 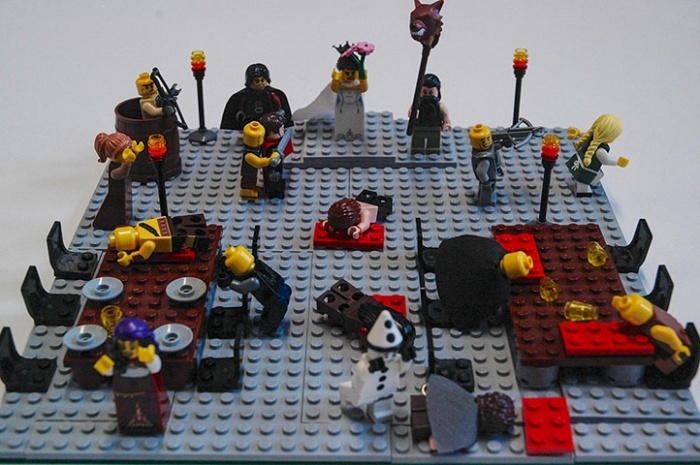 This link will take you to the website featuring the translation of David Foster Wallace’s Infinite Jest into LEGO scenes. The Guardian blog breaks this important story. This wedding scene from Game of Thrones speaks to me more. I like the square puddles of blood. The link is in the Guardian blog post. Clever I guess, but I don’t think it’s going to displace the e-book.